UPDATE 2/1/2011: Shucks, this eMagazine is no longer offered by Fictionwise, or any other epub dealer, as near as I can tell. But if you'd really like to read this story, email me at delewis1@hotmail.com. 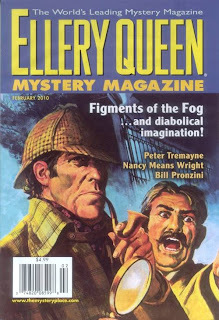 When my Skyler Hobbs story appeared in EQMM, I had a hard time finding a copy. We have several Borders stores and several Barnes and Nobles in the Portland area, and only about a third of them received the February issue. I heard similar stories from other climes. So I'm pleased to report this February 2010 issue is now available for download to anyone anywhere. One place to get it is FICTIONWISE, where you can choose from over a dozen different electronic formats. A single issue goes for $3.99 (less for Fictionwise members). Ain't this modern age grand? I'm still overseas and my subscription had run out and my poor wife ran all over looking for that issue. She found it but this would have been a nice alternative if she hadn't. I will renew my subscription (and AHMM) because though the modern age is nice I want to hold onto print as long as possible. Call me old fashion. It is but I'd hate to see those magazines disappear from local stores. Again, I like to hold them. I enjoyed the story immensely, with many a deft touch of characterisation. Well done! I agree, I'm hooked on paper, and it's more gratifying to see my work in book or magazine form. Meanwhile, the cool thing about online magazines is that anyone, anywhere has access to your stuff at any time - and for years to come. With EQMM (AHMM too) and other mags, the writers now have it both ways. Thanks, Nik. I'm assuming deft was a typo for daft. Finally found a copy, Evan. Thanks for the heads-up. --- It's a great story. A complete DAFFY DILL story by Richard Sale! It's a CONTEST! Win a BOOK!